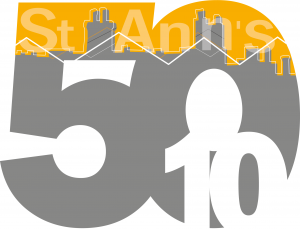 We’ve recently launched a new project called 50/10, which explores health and wellbeing in St Ann’s with local communities, and how they could hold the key to tackling health inequalities in the area. To get the conversation started, we’ve held free film screenings in venues around the neighbourhood, showing ‘Report: St Ann’s – 1969’, a film made by director Stephen Frears, which was broadcast on national TV just before the demolition and redevelopment of the area. 50 years on, the health inequalities highlighted in the 1969 film still persist, with average healthy life expectancy in St Ann’s 10 years less than Wollaton, just a couple of miles down the road. “Communities and neighbourhoods around the UK face great challenges, social, economic and environmental. They are also vibrant and diverse with rich resources of wisdom, creativity, passion, experience and resilience. St Ann’s is a great example of this and the 50/10 project aims to tap into this to improve health and wellbeing in the area and challenge health inequalities. At the moment, the vast majority of campaigns around health and wellbeing in the UK focus on people changing their individual lifestyles, without taking account of the huge impact social, economic and cultural factors have on health and wellbeing, such as housing, work, money, family, friends and community services for example. We’re working with The Renewal Trust to find out what’s important to local people when it comes to their health and wellbeing, inspired by the film ‘Report: St Ann’s – 1969’. 50 years later, what’s changed, what remains the same and what would be included in a similar film made today? The project is already inspiring some really interesting conversations and reflections and it’s clear there’s a real sense of pride in St Ann’s and a desire to challenge the way it’s often portrayed in the media. Many people feel the area is still home to a strong community, just as it was in 1969, but there are now fewer places to meet and therefore less everyday social connection between people – resulting in more social isolation and associated problems with health and wellbeing. One thing that local people think has changed for the better is the environment, with the area now home to improved parks and green open spaces. It’s fascinating to hear local people’s stories as they share what’s important to them, reflect on their own health and wellbeing and imagine how they might be involved in improving life in the area. We’ve worked extensively with both providers of health and wellbeing services, and directly with communities, and we really wanted to share this experience with St Ann’s – especially with austerity and reduced funding hitting public services harder and harder and traditional ways of doing things not always working. A rethink is urgently needed and that’s what 50/10 aims to deliver. Through talking to local people, 50/10 is gathering stories about life, health and wellbeing in St Ann’s, so we can explore why health inequalities still exist 50 years on, what’s important to communities for their health and wellbeing and how we can actively involve local people in developing new approaches to improving lives – including a new film made by young people in the area. We’d love to hear from you, your friends, families and neighbours about your life in St Ann’s. Your stories will help us explore what we can do together to build on what’s really positive in the community and in the area – to improve life, health and wellbeing for all. Email Holly to have your say!